Congratulations to Pacific Northwest National Laboratory Fellow Dr. Philip Rasch on being awarded the prestigious 2013 Community Earth System Model (CESM) Distinguished Achievement Award by the CESM advisory board. Rasch was honored for his significant contribution to the growth and prominence of CESM, in development for over 30 years. Rasch is the Chief Scientist for Climate Science at PNNL. CESM is a fully-coupled Earth System model, meaning all components of the Earth (atmosphere, land, ocean and cryosphere) "talk" to each other in the model. The model is also a community model, developed through the cooperative exchange of ideas and input from scientists and researchers throughout the United States, and available to them for research use. CESM models the global climate, providing state-of-the-art computer simulations of the Earth's past, present, and future climate states. A four-month stint in 1975 at a research station floating on a sheet of ice was the beginning of Rasch's interest in the study of climate. The project, called the Arctic Ice Dynamics Joint Experiment, was the first major study of how sea-ice moves and changes due to ocean and atmosphere influences. Rasch has been on the Earth-ocean-atmosphere case ever since. "At the time I was an undergraduate student, there was no major in geophysics at the University of Washington, so I chose the related field of atmospheric science," said Rasch. This eventually led to a fellowship in the advanced study program at the National Center for Atmospheric Research (NCAR) in Colorado where he was first exposed to the beginnings of CESM. "When I started working as a PhD student, the model was called the Community Climate Model. Then it changed to the Community Climate System Model, and it is now the CESM," said Rasch. In his career-long support of CESM, Rasch was formerly co-chair of the Atmospheric Model Working Group and team lead for the version five development of CESM's atmospheric component, called the Community Atmosphere Model (CAM5). 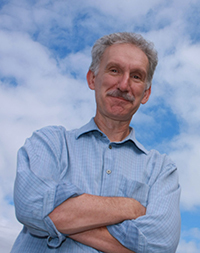 Currently, he is a member of the Scientific Steering Committee for CESM, using CESM for much of the climate science done in the atmospheric science group at PNNL. Rasch has a bachelor's degree in Atmospheric Science and another in Chemistry from the University of Washington; and a master of science and doctorate in Meteorology from Florida State University. He went to the National Center for Atmospheric Research (NCAR) in Boulder, Colorado as an Advanced Study Program (ASP) Graduate Fellow to complete his doctorate (jointly awarded from Florida State University). Following his doctorate, Rasch remained at NCAR, first as ASP Postdoctoral Fellow, and then as a scientist where he worked in various positions. He joined PNNL in 2008. Rasch also holds an adjunct position at the University of Colorado and is an Affiliate Professor in the Department of Atmospheric Science at the University of Washington. CESM is sponsored by the National Science Foundation and the U.S. Department of Energy Office of Science. Administration of the CESM is maintained by the Climate and Global Dynamics Division at NCAR.